e’ve added 14 new case studies to this pathway, some of which cover roles already subject to the Certification Regime, and the remaining ones covering roles which become subject to the Conduct Rules from 7th March 2017. 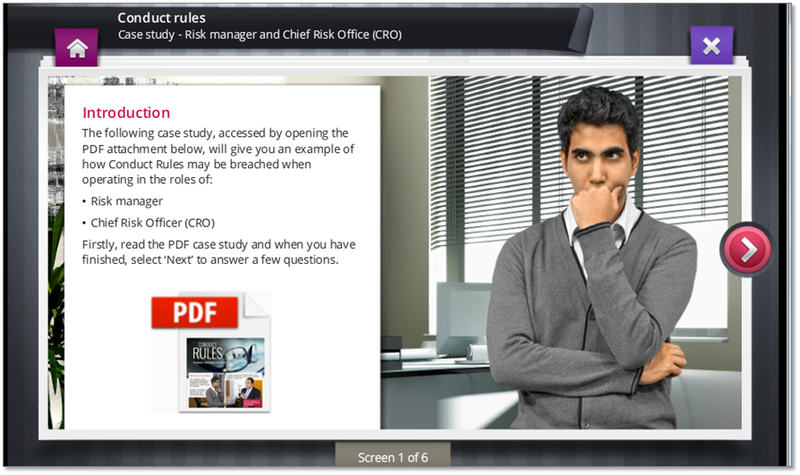 Each of the new case studies consists of a PDF document which describes a fictitious scenario for learners to study, followed by a series of multiple choice questions to check their knowledge of how the Conduct Rules apply to each job-role family. To enable learners to find the case study which relates most closely to their job role, we have organized them into a series of job-role categories contained in a sub-pathway. Because the structure of the pathway has changed, administrators will need to use the “Publish Changes” function for learners who have already been assigned this pathway but not completed it For assistance with this, please refer to the article on Publishing Changes here, or contact the Unicorn Helpdesk.